Moving Out of Your La Grange IL Home? La Grange IL Homeowners, this message is intended for you alone. If you are thinking of selling your house, consider selling the things you’ve collected over the years that you’d rather leave behind. While your home’s buyer might be happy to accept some extra paint for touch up, flooring and trim to replace wear and tear, or even some extra roof shingles, chances are that they’re only going to look at the mish-mosh of rumpus room items and garage “extras” with a mix of emotions at best. As you start to pack items away for the move in order to make your home appear more spacious for buyer showings, you’re bound to come across items that bring about some nice memories. At the same time, some of these items may also fall into the category of things you’d rather not pack and move to your new home, only to put into another closet to be forgotten about. When it comes to the items you may want to clear away, don’t hesitate to call upon Nancy Miller, real estate broker with Coldwell Banker, for input on what’s going to help your home show it’s best, and what items might be ready to clear out. If you need help setting up a garage sale for your community, Nancy is a good resource for that as well. 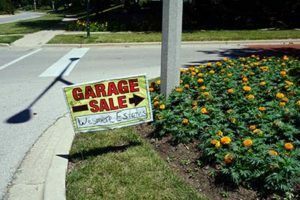 If this is starting to resonate, read on for some tips on approaching your garage sale with intent for your future. Shoppers like to see a little bit of everything. The moral of the story is that there is “something for everyone”. Don’t hold back if you think an item doesn’t “fit in”. You might just be surprised. When prospective customers drive by, they’ll more likely stop for full tables. Never underestimate the value of absolute junk. If you haven’t used something in the past year or two, consider selling it. For future use, consider your in-laws or friends as a “may I borrow ___” source, and save room in your own home. Dressers, exercise equipment, tables, toys, and tools attract traffic. Keep these in mind as you go through your home, but DO NOT pull a “bait and switch”. Only display items that are actually for sale, unless an item WAS for sale and is waiting for pick up. Make sure appliances work. Have an outlet handy so items can be tested, should the need arise. Clean everything. Whether it’s junior’s latest least favorite toy or dirty dishes – dirt fetches a far lower price than their clean counterparts. Large items bring the most foot traffic. The more interesting the item, the more likely you are to get people moving toward it. If you sell a couch or table early in the day, ask to keep the item with a “sold” sign on it until the end of the day. Place an ad in a newspaper. If you partner with neighbors, you can often split the cost. Check the weather if it’s in the near future. Even if your sale is indoors, bad weather keeps customers at home. Saturday is often the best day for a sale, but in some places, people favor Thursday and Friday sales. If you are new to an area, ask around. This might encourage your neighbors to get involved. More garage sales = more foot traffic = more chance of selling your less-needed items. Are the items still for you. You’ve shaken off the dust. You’ve cleared the space. It’s a funny thing: sometimes getting individual items out of their familiar place is enough to see that you don’t need them any more. And sometimes, it’s enough to show you that you could still use an item. Tip: be discerning on whether or not you let the piece follow you to your next home. Store them for another day. Are we talking about an “everyday item”, or a “once in awhile” item that you’re holding onto for the next costume party, block party, etc? Good Will, Salvation Army, Church… Whatever your choice is; there are many charitable organizations that might be willing to pick up, or at least, accept your donated items to help those less fortunate. Just be sure to keep a list of donated items for your accountant at tax time. Would you be embarrassed to pass it onto a charity? Maybe it’s time to donate to the garbage dump. Perhaps when hosting a garage sale, sometimes it’s best to go solo, and sometimes it’s a benefit to include some of your neighbors. 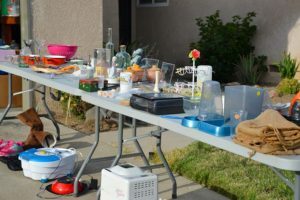 When it comes to including a charity and neighbors, perhaps suggest a pact: on the Monday following your neighborhood garage sale, have the charity of your choice come through the neighborhood for a large collection. Regardless, of what your motivation is to clear the clutter, know that there are likely to be those that would benefit from the sale of your forgotten items.